Happiness makes people about 12 percent more productive in the workplace, the University of Warwick reports. That's no big surprise, but how do you make your employees happier so they’ll focus on their jobs and stay more productive? The answer isn’t really about offering tons of perks and praise, but a few simple tools and strategies to help them do their jobs well day in and day out. From social tools to empowerment, here are five tips to help you and your employees stay focused throughout the workday. According to Microsoft, nearly half of employees report that social tools for business help increase productivity. Meanwhile, 30 percent of companies underestimate the value of these tools and restrict their use. Think back to when email was on the rise. What would your company be like if you didn’t embrace the communication tool? Open the door for more collaboration and communication with tools like Microsoft Office 365 and Yammer; not only will employees be able to collaborate quickly, the business can quickly scale as demands change. The benefits of exercise are more than just keeping your heart healthy — it can also give your brain a boost of endorphins and even improve memory. Incentivize your employees to get moving by offering gym memberships and encouraging them to work out. Whether it's before work, at lunch or at the end of the day, working out regularly can improve energy and focus, and help employees feel like they're doing more than sitting around behind a desk. Research done by social networking company the Draugiem Group found that working longer was actually lowering productivity, and the real secret behind raising productivity was working smarter with frequent breaks. The research indicated that its most productive employees didn't work full eight-hour days, in fact, they took 17-minute breaks every 52 minutes of intense work. The idea is pretty simple. Our brains are a muscle and require rest to work at peak efficiency. 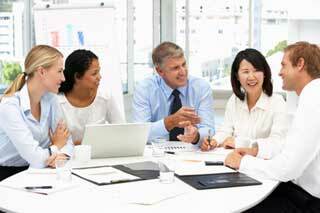 Busy professionals attend over 60 meetings a month, Verizon reports. Take a look at how many meetings are on your company's agenda. How many can be eliminated altogether or condensed into one weekly meeting? And when you must hold a meeting, opt for a stand-up or walking meeting around the building to clear your heads and get a little exercise to regain focus. Your brain may just think you’re taking a break and get that rest it's looking for. How much autonomy do your employees have to perform their job efficiently? Instead of requiring multiple levels of approval on every task they complete, put the authority in their own hands. Employees who have ownership over their jobs are more likely to share ideas, advocate for the company and are more committed to their workplace. Come up with a list of responsibilities employees can tackle without hand-holding and give them the necessary directions or scripts to make their own decisions. At Insightlink our primary goal is to help improve your over-all organizational performance. There is a lot of evidence that shows that as employees become more satisfied and engaged this creates positive outcomes for your organization as a whole, including higher productivity, improve retention, less turnover, and greater customer satisfaction. We help you get you the knowledge and insight you need to improve job satisfaction and engagement and obviously then you get to benefit from all the advantages these improvements bring you. Please get in touch if you would like a quote, to schedule a demo or just want to chat and learn more. You can write us info@insightlink.com, call Lynn Gore at 866-802-8095 ext 705, visit our website for more details at www.insightlink.com or feel free to download our Guide to Employee Successful Employee Survey Research here.